Heavy Water Experiments’ (formerly Imogene) new self-titled release is a dense swirl of 60’s prog and psychedelic rock. The lush sonic swirl and non-standard instrumentation (eight string as well as four string bass, vintage keys and drums) definitely pays homage to the psychedelia of years past, however the bass heavy progressions are often reminiscent of Morphine. 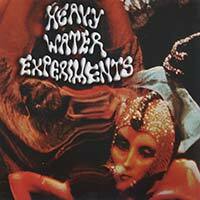 The mind altered musical melenge aside, Heavy Water Experiments still have a decidedly subtle rock and roll feel. The new self-titular release proffers up 12 groove heavy, jam length (mostly) tracks. I suggest listening to it in the dark with headphones on so you can pick up all the nuances, and if you have one, fire up the lava lamp and let the trippy jams play on.